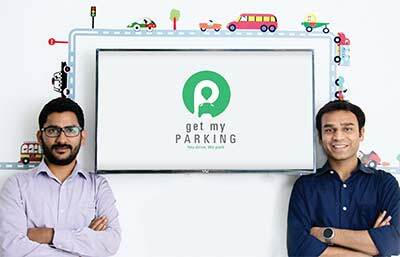 Get My Parking is a Delhi based funded venture started in July 2015 with the aim to transform the parking industry. It is digitizing the parking industry through mobile solutions & empowering motorists to search, book and navigate to relevant parking in real-time. “We are organizing the industry by serving the parking contractors (enterprise solutions), government (smart city), infrastructure partners (integration) and the consumers (mobile apps). Our vision is to create a constant vehicle companion that solves all problems faced while driving, starting with parking”, says Rasik Pansare, Co-Founder of Get My Parking. The market opportunity for parking is estimated to be over $100 billion and most of the existing solutions are not flexible enough to succeed in emerging markets. Get My Parking attempt to streamline any unorganized market. For Parking Contractors: Digitisation of parking ticketing and management which reduces revenue leakage and enables real-time business control. The platform integrates with any access control hardware for end-to-end mobile based parking management system at very low capital cost. For Citizens: Get real-time availability, search, reserve and navigate to parking space in advance. Pay cashless and get relevant deals where you park. For Urban Planners: Get city-wide macro level data about where, when, how many vehicles are getting parked. Real analytics for policy making. It was in 2012 that Founders Chirag Jain and Rasik Pansare met during Jagriti Yatra – a 15 day train adventure during which they traveled across India for 8000kms meeting entrepreneurs. and change-makers. Two years later, work on Get My Parking got started. “From deploying our technology at a single mall in Noida, we have now developed to serviceover 125 locations in Delhi, NCR using over 350 of our smart parking systems. We process total 30,000 parking transactions per day”, says Pansare. Official parking partners. Spectators going to cricket stadium searched and booked for parking through our app or a deeplink on Delhi Daredevil website. All public parking lots around 1km from stadium were on-boarded on the app for matches. Appointed to provide entire smart parking ecosystem in Ujjain. 11 Parking lots – 30 days – 400 hectares of dedicated parking area – 2500 operators – 200,00 parking pays – 5 million vehicles – 50 million visitors. Sort of mini-kumbh for south India. This event saw us empowering 54 parking lots around Vijayawada with over 150 smart parking systems for 12 days.